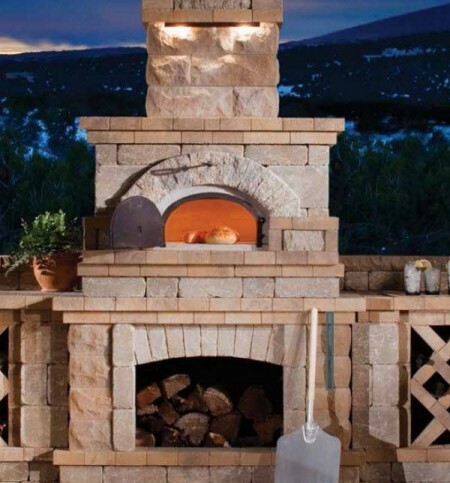 Pizza Ovens For Sale in Grimsby and Stoney Creek - Legends Landscape Supply Inc. Imagine achieving the taste of authentic pizza, baked in a traditional Italian wood oven, right in your own backyard. We offer high quality outdoor pizza ovens that provide our customers- and even the most discerning chef- the best results. Our top of the line Fontana Forni Maxi Gusto ovens are beautifully crafted and designed with the high-end consumer in mind. These ovens have stainless steel and anthracite painted steel livery. The cooking chamber has three levels of stainless steel and refractory plates with double ventilation and lighting. Included are grills, cooking pans, a stainless steel chimney, side and front worktop and fire tool. All you need to supply is the wood. What’s Included in Modular Styles? Modular options contain your complete kit. They come partially preassembled, and require roughly an hour of stacking once they are in your desired location. Select from industrial-luxe models from Fontana Forni, modern stainless steel options from Sole Gourmet, or natural gas models supplied by Grill-rite. What’s Included in Preassembled or Mobile Ovens? Both these options provide you with a finished product, requiring no assembly. A preassembled style sits atop an existing base or outdoor countertop, while a mobile style is freestanding on a steel base, similar to a barbeque. Visit our showroom to browse the many great looking outdoor pizza ovens that offer old world charm and authentic results.